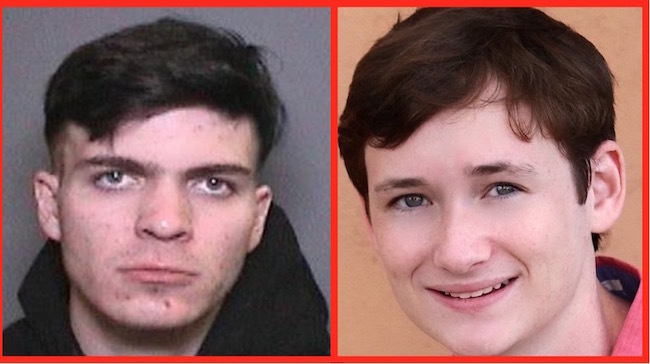 20-year-old Samuel Woodward, the man charged with stabbing and murdering Blaze Bernstein, was a member of a neo-Nazi group, according to ProPublica. The site reports three people who knew Samuel Woodward say the Newport Beach man belonged to the Atomwaffen Division, a Fascist group aspiring to overthrow the American government with weaponry and acts of terrorism. ProPublica said two of their sources were personal friends of Woodward’s. The third was an ex-member of the Fascist group, who said Woodward was active in both combat and firearm training. No word from officials about Woodward’s alleged affiliation with Atomwaffen Division. Talking to Los Angeles Times, Jeanne Pepper Bernstein said she’d worried her son would be a victim. The body of 19-year-old Blaze Bernstein was discovered in a shallow grave in Borrego Park, a week after the Woodwards reported him missing on January 3rd. Bernstein was a pre-med student at University of Pennsylvania, and had been visiting his parents between semesters. The student been stabbed more than 20 times. DNA evidence at the murder scene and in Woodward’s automobile led to Woodward’s arrest on January 12. Samuel Woodward is scheduled to be arraigned February 2. Well, definitely a first degree kind of Murder. Cue up the usual trolls who will blame the victim for being murdered by this Nazi scum. I’d love to hear the back story on this. I mean how did he miss the clues that Woodward wasn’t right in the head. My thinking is that Woodward freaked out after the act was done. Guilt for what he just did. Only way to explain the viscous killing. He was a 19 year old kid that was enamored with his eventual killer and you miss a lot of things. Unfortunately it happens quite often. Horrific, but not surprising news. I feel so bad for Blaze Bernstein and his family and friends. White supremacist/racist nutcases like Samuel Woodward are no friend of LGBTQ people. The teenager who killed two parents in Virginia who’d warned their daughter about dating him allegedly belongs to that neo-Nazi gruop Woodward is part of. Third paragraph from the end, it says the victim (Bernsteiin) was reported missing by “the Woodwards”. This is a story written on Queerty of course there must be an error somewhere. It’s a gross error. But as usual, Queerty may or may not correct it. I hope they will, for the Bernstein family’s sake. I’m kind of amazed they at ran the story at all, though. They still haven’t touched the story about the white gay landscaper who murdered at least two and possible five gay men, several of them Middle Eastern Canadians, chopping up their bodies and burying them in planters. 1300cc brain. protruding supraorbital ridges. Definitely a Neanderthal. Anyone else notice ol’ mhoffman’s dead silence on this one? As long as the victim is gay jews don’t care. I just happen to click this article and read it. Saw most of the comments and agreed with them, so didn’t feel a need to respond, until I read your comment. Bob, that’s a pretty inflammatory statement to make about Jewish people. Let’s curb the anti-Semitism. Not good, man, it’s beneath you. mhoffman and his alternate handles has proven to be a lying, small-minded person who contends with a decent amount of internalized homophobia. But this was a completely unnecessary and inflammatory thing to randomly throw out there. @Kangol…………….come back with the reason as to why the Israeli’s haven’t caught nor a looking for the killer of three gay jewish kids outside of a gay youth center in Tel Aviv a fews years back and we will talk. Stick with your middle of the road comments and be sure not to rock the boat as you do PERFECTLY. Many parts of the Middle East don’t like gays, but I’m not entirely sure about the details of that particular story since I don’t remember seeing it being reported.